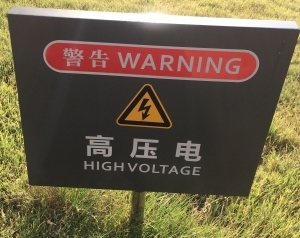 In the following signs, we have 高压电 (high voltage) and 低压电 (low voltage). Chinese Converter gives the pinyin: gāo yā diàn and dī yā diàn (this has been wrong in the past). 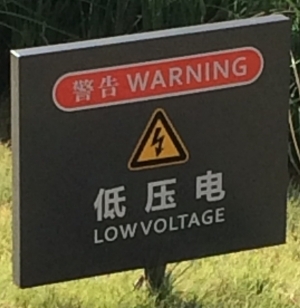 However, Dict.cn and WrittenChinese.com assign 压 two possible tones: yā (first tone) or yà (fourth tone). So I don't know which is correct. Question: What is the correct tone for 压 in 高压电 and 低压电? Actually, both tones are possible. In different rigon in China, people have different pronunciation of the same word. However, yā is the official pronunciation of "压". And it used in more scene than yà. According to Chinese daily habits,Chinese prefer the first tone and in many formal situations,like CCTV, the hoster speaks the first tone.But if you want to speak the fourth tone,they can also understand your idea.So you don't care whether the correct tone is first tone or not (if you're talking with Chinese ).But if you're preparing for exam,I think you should choose the first tone. Not the answer you're looking for? Browse other questions tagged pronunciation tones or ask your own question.